I talked myself into going with my wife to a local Salvation Army thrift store yesterday. The usual routine is that she goes out and then I go out — with three small children, that’s the only way to get anything done. I don’t like the division of our time, though, and wanted to spend time with her, so I suggested that we all just go together. The inevitable — at least, the inevitable as defined by my wife — happened. She shopped very little. I shopped a little more. I bought Stuff for the Kids that they Didn’t Need. We chased children around the store. But best of all, like most thrift stores this one had a healthy used book section. When I saw a hardcover copy of Gabriel Garcia Marquez’s The General in His Labyrinth I couldn’t resist picking it up. There was no need for me to do so, really. I own almost all of Marquez’s novels, probably in first edition hardcover, and have read almost all of them, including this one. I don’t really know why I had to pick up and flip through a book I already own. I’m glad I did, though. 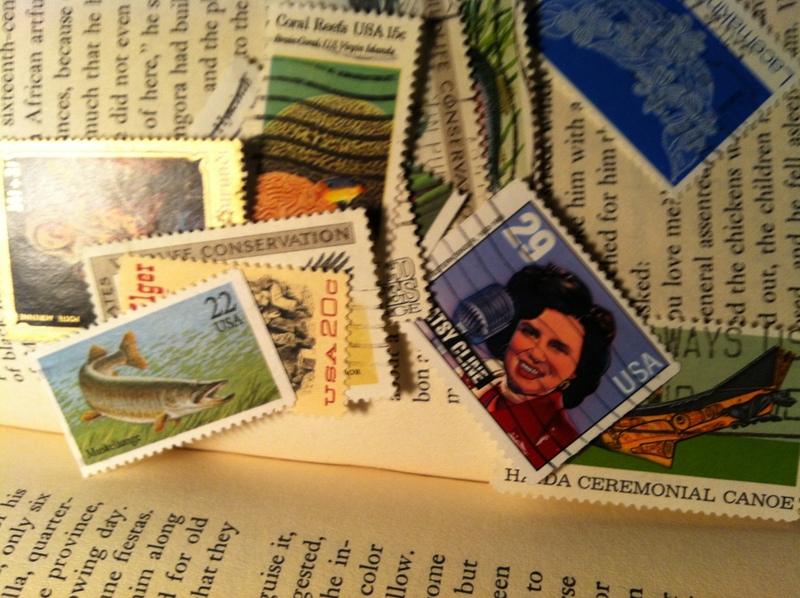 I opened the book to a small collection of about ten or fifteen stamps. Two or three dropped to the floor before I realized they were in there. I asked my son to hand them to me. Then I realized I had to buy the book. Cost wasn’t an issue — the book was $.99. But that wouldn’t matter anyhow. The book had a history. It had been owned. It had traveled. I don’t know why or how it wound up in a thrift store, or why it was filled with stamps, but that’s all part of its history. As an object with a history, it is not in fact identical to the other copy of the same book that I own. It has acquired an originality and uniqueness. The stamps are as much a part of this book, now, as its cover and its words. So it sits on my shelf next to me, apart from the rest of my Marquez titles, having acquired me as part of its history as much as I have acquired it. Next Next post: Introduction. . .